I've been quiet online, but that means I'm working behind the scenes. I'm currently revising the entire Immortals series (my books in them anyway), looking to re-release them sometime in December. 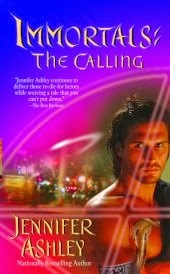 The Calling has come back from the editor, she now has The Gathering, and I'll be finishing up The Redeeming soon. I plan to release all three books at the same time so no one has to wait between. BTW, when I say "revise" I mean smoothing out the writing and fixing errors. The stories will be the same, but I hope to give readers a smoother read. I also now have the rights to the original cover art, which I'm having redone, plus I have the beautiful covers Kendra made for me a while back. I'm going to use both! I'm also realizing how much I loved creating this world. Joy Nash, Robin Popp, and I brainstormed constantly as we wrote the books, and we came up with a very cool place. I am already spinning more stories in my head set in this world. I'm pleased to have another chance to work on this series! Stay tuned for a pub date and buy links. The books will be out at Kindle, Nook, Kobo, Apple, Sony, ARe--the usual places, as well as new trade paperback editions. A lot of work for me, but it's great! Sign up to my newsletter to get news in your inbox of the Immortals series release (and news of other series as it happens). Our Dark & Dangerous paranormal romance boxed set hit USA Today! And there was much rejoicing. (I realized it was my 15th book on the list, which is cool). Thanks go out to our readers! Stories by Jennifer Ashley, Bonnie Vanak, Felicity Heaton, Erin Kellison, Laurie London, and Caris Roane.